I have always felt a slightly out of step with my fellow booksellers. You see, I have a rule that when I tell it to co-workers or other readers they usually look at me like I'm crazy. I only keep 50-75 books in my house at one time, that number has grown a bit because of all the unread books I keep. But if it starts to creep up, I purge. 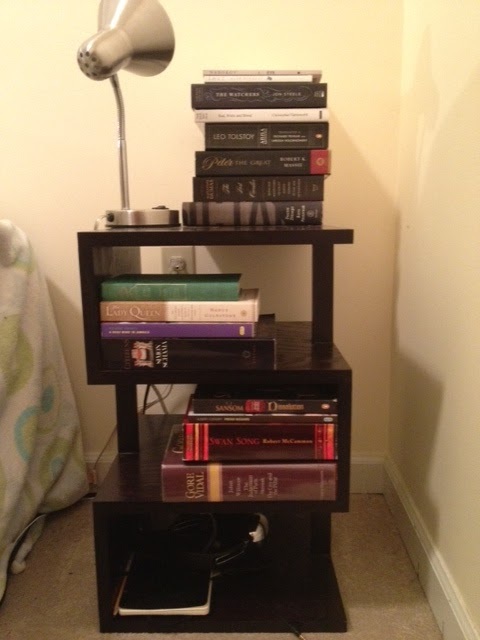 I don't have fancy shelves, I don't have any emotional attachment to the physical book. I'm not a regular e-reader, I just view the books themselves as vessels, and once I read a book...the story is with me. 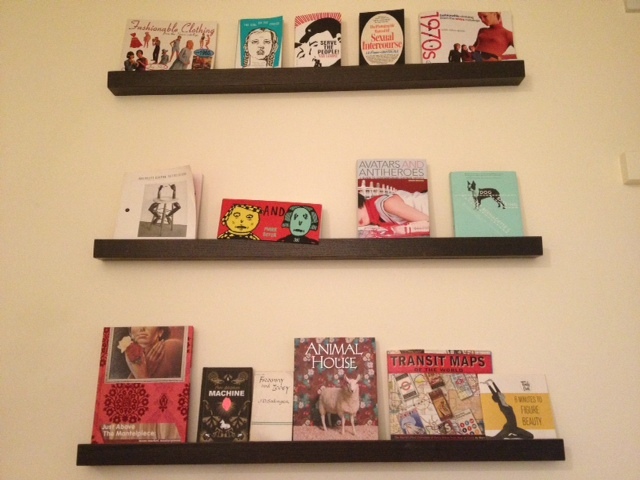 This picture is my 'bookshelf'. I have made a few exceptions, sentimentality can't be completely routed out. My first copy of Little Women, it's broken in half, but I can't imagine parting with it. Various different editions of The Confederacy of Dunces, The Basement by Kate Millet...the most chilling book I have ever read, a handful of exercise reference books, a signed copy of Henry Rollins latest book, a copy of Rubyfruit Jungle that is signed to a girl I dated (we broke up before I could give it to her, and selling it or donating it feels weird). And a bucket full of kids books for my boyfriend's son, and he can only have the one bucket. I'm surrounded by people that have stacks & stacks of books at home, they brodart the covers, they dust them probably (hopefully?) and when they move everyone hates helping them because they have 50 back breaking boxes. I'm just not that kind of reader. BUT I AM A READER! 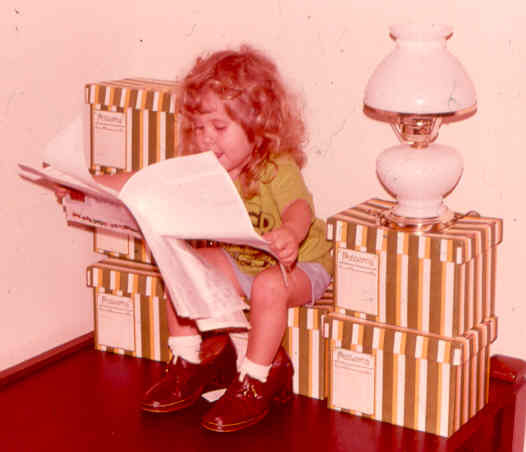 I've been reading since I was three, I stayed up way past bedtime with the best of them, reading by flashlight. I even read in the SHOWER...that's right, with a sandwich bag over a mass market...BOO YA. But, I feel like my 'book person' status comes into question when it's discovered how few books I own, and that I fold corners. YUP, you heard me. Don't get me wrong, I think books are beautiful, I love a particularly clever cover - and the feel of delicate pages is wonderful. (side note - enough with the covers that feel like synthetic human skin already...) I don't want people to stop buying them, I certainly haven't and can't imagine the day. I bought curator shelves to display books I feel have risen to the level of artwork, it's a great way to switch out my art as often as I like. I have an appreciation. Maybe I feel a bit defensive when I work in an industry where most of my peers talk about rooms they can't access in their house anymore because they're filled with books. 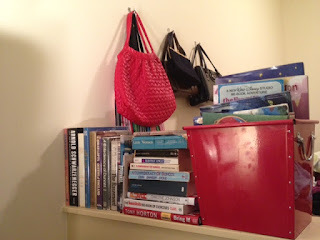 It feels as if I must prove my passion for books by hoarding. Well, I'm here to say that I am a book lover, I will surround myself with the stories I love for the rest of my life AND will stand proud by my small pile and bucket. The other place I have books in my house, since clearly there aren't 75 books shown above - are my nightstands. The majority of the books I have in my house are books I haven't read. It's an assortment of advance reader copies, some Russian absurdist lit (Daniil Kharms..xoxox), books I read about in reviews of other books, a bit of Gore Vidal and a vampire novel. 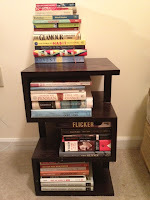 Crafting this post I've decided that before I start another book I will finish each of these books! (Even as I type that I know I won't make it....) I am a very fickle reader, feeling the grass is always greener with the books I DON'T have in front of me. 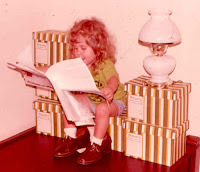 So, I may not care if any of my books are signed, I may not care about maintaining the value of the books I do have, but what I care about has remained the same from my first foray into the world of Nancy Drew...the story! My head and heart are filled with characters that have shaped who I am today. Big stuffed and messy shelves or not...I AM READER! rawr. Having been an avid reader for most of my life, I have slowly come to understand, acccept, and sometimes even welcome the changes that Hollywood makes to my favorite books. It wasn't until the Harry Potter movies that I was really able to embrace the idea of a movie as a new and different incarnation of a book I loved. Until then, I found myself leaving movie theaters, often steam issuing from my ears for the changes that producers and directors would dare to make to my beloved books. At any rate, nowadays I seldom find myself angry at a movie for going "off-book". Until now. 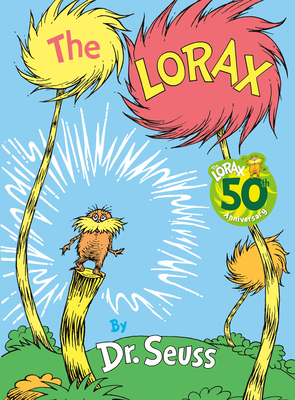 I grew up reading the Lorax. To be honest, it's the only Seuss besides the Grinch that I really adore. So when the teaser posters and trailers started appearing for the movie, I was more than a little excited. And then reality set in. This current movie incarnation isn't the Lorax. It doesn't even resemble the Lorax save for a few similar characters. And when I say a few, I mean it...the book has three basic characters, the movie seems to have about 57. 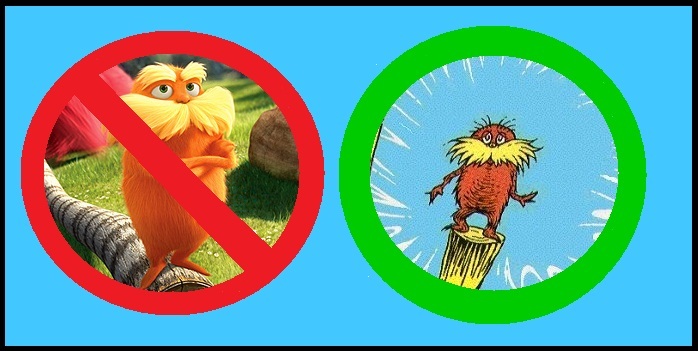 Now I understand that things need to be added to a children's picture book in order to turn it into a feature length film...but the Lorax already had a lot to go on...a lot. There is some pretty heavy plot in that bad boy, industrialization, environmental depletion, and hermit-induced depression. But hey, you know what this book really needs, a pre-teen love story, gender-based stereotypes, and turning the wise hero into a bathroom joke-spewing, curmudgeon. Box Office Gold! So while I already have my tickets to see the Hunger Games, I'll be sitting the Lorax out. Read the book, I can guarantee it's much better, and the brown barbaloots will thank you for it. Books and cats just seem to go hand in hand. Perhaps it's the calm and stillness of a napping cat that makes them the ideal lap companion when snuggling into that new favorite read. We know a lot of you out there love your cats... almost as much as you love reading so here are some fun, kitty tidbits. We've got a great event coming up on Sunday, March 18th at 5:30 PM. 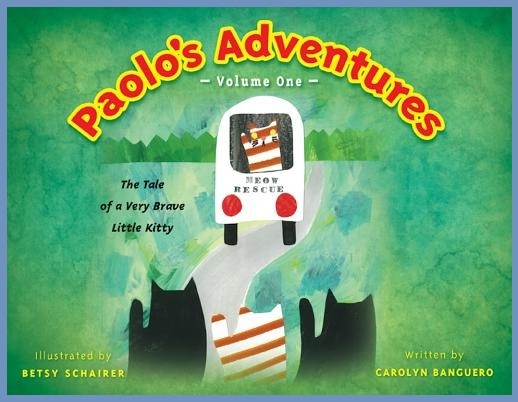 Come meet Carolyn Banguero, author of Paolo's Adventures : The Tale of a Very Brave Kitty. Banguero tells the story of Paolo, a brave little cat who finds himself at MEOW (Mercer Island Eastside Orphans and Waifs) Cat Rescue. Follow Paolo's journey in this sweet tale about a cat on the mend and the people who help him. And best of all, a percentage of the net proceeds will be donated to MEOW. Do you love kitties but struggle with allergies? Well, do we have the answer for you! 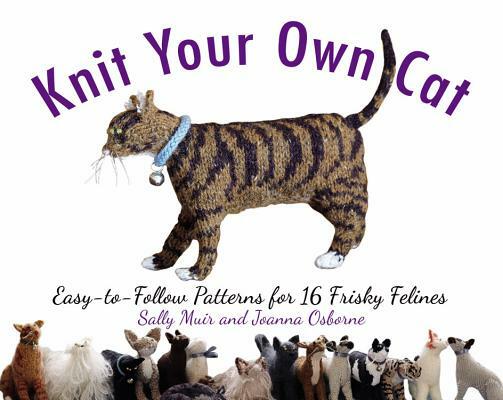 Knit your own cat with Knit Your Own Cat : Easy-to-follow Patterns for 16 Frisky Felines by Sally Muir and Joanna Osborne. This book is packed with a litter of woolly cats to cuddle and love. Fantastic photos and clear instructions make this a great idea for the cat-lover OR the knitter in your life. Or would you like to take your crafting to another level? Are you clamoring to include your kitty in your crafting pastimes? Well, look no further than Crafting with Cat Hair : Cute Handicrafts to Make With Your Cat. 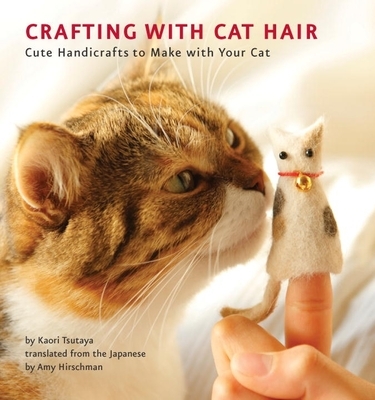 Kaori Tsutaya has put together a crazy collection of crafts made from...that's right, cat hair. Tsutaya has found a way to transform every cat-lovers curse into crafts fit for any stylish, crafty boutique. You've got to see these adorable creations to believe them. Third place staffers certainly know that cats make the ultimate reading companion. A while back we did a poll and counted a number of those purr-fect pals among the staff. Here is one of the newest editions to the reading family. 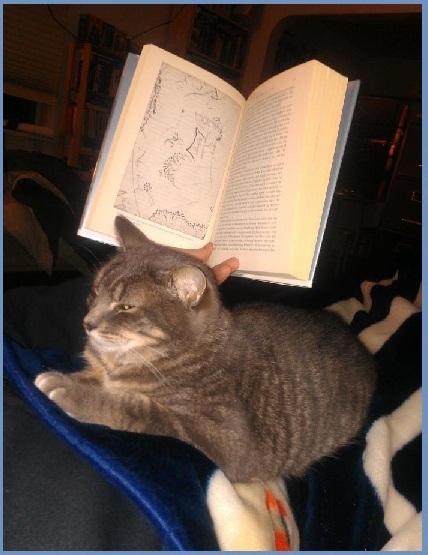 It's Zipper, and he loves cuddling up for a good read with his human companion, Steve. 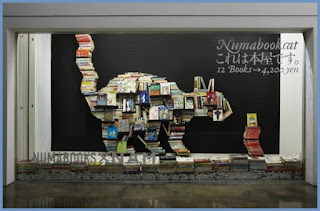 And finally, check out this pretty awesome cat/book sculpture from Catsparella. So, as winter winds give way to a sometimes fickle Northwest spring, curl up with your favorite, feline friend and enjoy a fabulous book.